President Elect Philip led a fast-paced meeting and did it with great aplomb! He zipped us through a long agenda and managed to leave lots of time for our amazing guest speaker, Sally Silverstone. who couldn’t get to our meeting. Allan exchanged flags with the Commodore at his hotel! Want to be on TV? Correspondence from Producer Ben Crompton, Eyeworks TV Australia, asked for names of Australians who ‘migrated’ to Bali or visited frequently. He wants to learn what Bali offers that draws them to the island. We happily supplied a list of names (sorry, we didn’t first ask anyone for permission…just did it!). Now we’ll wait to find out if one of those named becomes a TV star. Good news for a Global Grant project in the works…past guest Rtn Lesley Bredvik, RC Bozeman Noon (Montana USA), and also with the American NGO Dining for Women, offered the possibility of providing some needed funds to support a health project at Klinik ASRI in Kalimantan (formerly called Borneo). We’re grateful for Lesley’s interest as we continue to work on the project application. Rtn Sue Bennett will open her home and hospitality for a club Friendship gathering on August 18. Time and a map to Sue’s home will be coming to members soon, so save the date. system. Basically this is just a different way to connect you to our Bulletin, which continues to live on our website. But instead of Marilyn doing the laborious task of sending out the emails that linked you to the latest Bulletin, now our Newsletter does it for her – still with her witty introductions. The first distribution seems to have gone smoothly and we’re breathing easier. Now we’d like to hear your feedback. Please reply to the Newsletter and let us know what you think. After all, it’s our readers who count most! Sally Silverstone, our guest speaker, told us the fascinating story of Biosphere 2, of which she was a team member. Biosphere 2 started almost 30 years ago with a huge cast of characters. Eight people, including Sally, lived inside Biosphere 2 for two years. It was a fully-enclosed system, perhaps the only one in the world, which mimics Biosphere 1 (planet Earth) as much as possible. The goal was to prove that man could live sustainably without destroying the life systems supporting him. The Biosphere was completely sealed – more tightly than a space shuttle. It was a huge engineering challenge taking 10 years to design and build. The team moved in in 1991. 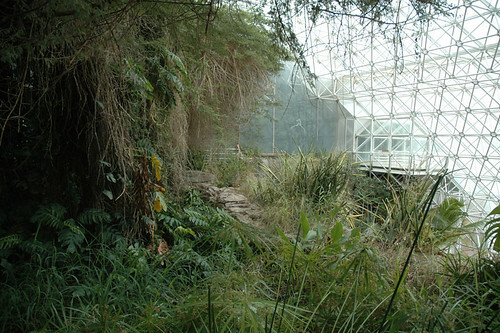 Biosphere 2 had a rain forest, an ocean with a coral reef, savannah area, desert, and an agricultural area of less than 1/2 acre which provided 85% of the team’s food for two years. Each member had his or her own small living quarters. Sally was in charge of agriculture and grew all the food for the full two years. The very low levels of light and two El Nino years made growing food difficult. the age of digital photography. Temperature and humidity were controlled by computer, and all the water and air circulated constantly. There was a workshop where most things could be repaired. The farm was divided into small fields and crops were rotated. Every morning the team would meet and discuss the work to be done. It took a lot of work producing the food and collecting data. The team doctor conducted medical research and approved of the clean, healthy diet dictated by the Biosphere conditions: low in fat, high in carbs and nutrient-dense. All the team members emerged in excellent health. When their blood was tested they all had the blood chemistry of 12-year-olds! Carbohydrates included wheat in winter, sweet potatoes and rice. Pygmy goats were used as “composters” and produced small amounts of milk. Silkie chickens were bred with jungle fowl to create good brooders who would eat anything. Bananas were the only source of sugar in the diet. Sally brewed alcohol from bananas and grew minute amounts of coffee, just enough for a cup a month each. All the crop waste went to the animals, or was hand-milled and composted down. Human waste went into waste-water gardens, and the water returned to the fields for irrigation. All the food had to be processed and dried. Sally wrote a cookbook with her recipes based on the food available. To keep up morale, the team agreed to reduce rations so they could feast every 6 weeks or so. Sally reports that the most important thing they learned was that there is no such thing as AWAY. If something was accidentally brought into the Biosphere, there was no way to dispose of it. After Biosphere 2, she and two other team members started the Biosphere Foundation to focus on coral reefs and oceans. For the first ten years they sent out many expeditions around the world and provided a wealth of information, much of it used in Al Gore’s ‘An Inconvenient Truth.’ Working with local NGOs, they started waste-water garden projects to prevent waste entering the ocean. Sally now works on Menjangan Island in NW Bali doing a baseline study of coral reefs. The main damage to the reefs was being done by the anchoring of tourist boats, so Sally started a small project working with local dive and boat operators. A series of mooring buoys were put in place and visitors were educated about the importance of protecting the reefs. At the request of the Bali National Park, they started a farming program. Most fodder and firewood for cows is collected from the forest. The team is looking at extending the growing season with drip irrigation and introducing dry land crops for fodder. They are introducing organic farming and testing different kinds of corn (composite varieties, not GMO or hybrids) and two of these varieties are very successful in that area. The goal is to maximize the growth of fodder on the farms and produce cash crops to eventually replace the Bali cows. Another small program deals with invasive plants like lantana – one of the worst invasives on the planet – which is taking over large areas of forest after damage by fire. A recent program brought 18 teens (eight from Bali and the others international) to Menjangan for a ten-day program to help them see the world as a closed biospheric system. August 18, Fellowship at Sue Bennett’s Home.